- Berrys's first subway ride! She slept the entire time! - Went to J.Crew to try on the oxfords I thought I wanted. It wasn't as nice as I expected. Tried it on, and I wasn't in love. So yeah, scratch that off my wish list. At least I can focus my energies on wanting something else, No. 6 is that you? Let's see! I hope it's not gonna be a disappointment, imagining how it is and not living up to my expectations. One thing I know, trying things on is the best way to get me back to my senses. - Another celebrity sighting in the person of Liev Schreiber! In true New York fashion, people would just walk past him, not even giving him a second glance. When I told Dear Hubby about it, he said I was probably the only person who got starstruck. I think so too hahaha! - Had to check out my holy grail! Isabel Marant on Greene corner Broome! It was supposed to open this month but was moved back to April. Good! I still have time to save! - Of course, passed by A.P.C. because I wanted to see the S/S collection and the Jersey collection but saw nothing I absolutely had to have. Well, I like the quilted parka in army green below but not to a level that it will keep me up at night thinking about it. Besides I already have an army jacket and an army parka. Two is enough, it's not like I need to outfit a platoon. - Popped by Curve and saw a really nice McQueen scarf. I read somewhere Barneys sold 500 McQueen scarves the day news of Alexander McQueen's passing spread. I didn't buy one though, but it crossed my mind that his stuff, pieces he designed himself, might one day be worth a lot no? Did I shop? No! I was a good girl. It was strictly a day of window shopping. Ok, I was thisclose to buying a gingham flannel shirt from Uniqlo. It was just $29.90 and as I was deliberating on it, asking my SIL Les "Should I? What do you think? ", Berry looked up at me and said, "Daaa-ddy". Ok, that was my reality check. I have a feeling Dada taught Berry to keep an eye out on Mommy when we're out. Talk about carrying my conscience! Incidentally, Benefit was giving out Sugarbomb face powders for free! 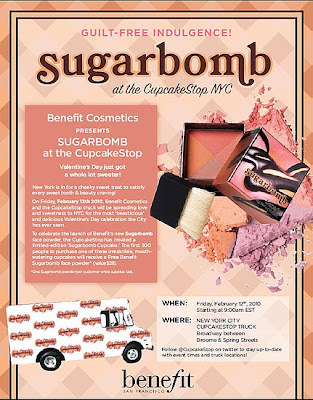 One with every purchase of Valentine's Day themed Sugarbomb cupcakes at the Cupcake Stop truck! Dada, Berry, when it comes to Isabel Marant, please don't stop me! I agree, with Isabel Marant it is just difficult to remain financially pragmatic. But when it comes to maxing out your credit card with IM pieces, it isn't as remorseful. Or maybe I'm just in denial. I can't wait to read about IM when it opens... Inggit!!! Hahaha! We're totally on the same wavelength when it comes to Marant! I'll write about it Ruby! Heeheehee!